When I started elementary school, always with the teacher’s bulletin boards, posters for school events, elaborately decorating my folders with scenes from plays, 4-H projects and homework were always artfully oriented. It started when I was little. A community of artists, creatives who are also business minded. A community of creative, silly, youthful students to help keep me young at heart. Great opportunities to expand my teaching and illustration career. I work for a lot of educational institutions, the Portland Museum, Riverside the Farnsley-Mormen Landing, the Carnegie Center for Art and History, coming up with all kinds of creative and history based art projects. Teaching people to be creative in all aspects of life, that’s how I like to be involved. Julia Comer, jewelry designer and artist. I’ve worked with Julia in many capacities, shared a studio, been a shop girl in her gallery, learned more patience and more tenacity, quality of craft and goodness from her, to push myself through her excellence, creativity and perseverance. I would like to see a more positive, peaceful place, brought on by working together, communicating thoughtfully and rationally, and more and better education. People paying attention to each other, nature, our environment. People unplugged! Beauty - art, music, dance and poetry surrounding us and helping to answer problems. I live in a little house in the Highlands. A little house on a little street, we can walk, ride bikes to dinner or the grocery or the green parks or to visit with friends and neighbors. Big old trees and gardens, red-tailed hawks soaring between the trees, families and doggies everywhere. People young and old, mixed together, living everyday together! Get your masters in education and business!!! A freelance career gives you a lot of freedom but not a lot of stability, it would be nice to have more choices in job opportunities. Be in the now, and start a retirement plan now. Keep a small, sunny place in the country. Be happy, create, use your mind and don’t stop exercising your mind and your body! Marcia Boone asked me to be involved in re-working DinnerWorks when we were painting together one day. After that I did Orange Night of Art, Art Auction, helped start Art Squared and Open Studio Weekend… the rest is history! I got into trouble in the First Grade for drawing all over my homework assignments, tests, any paper I had really. It became such a problem my parents had to meet with my teacher and they all agreed I needed to pursue art. It’s my way of giving back to the visual art community in Louisville without making a profit. I sell local art daily at my business, but it means more to me than a paycheck. LVA is my way of walking the walk, and I enjoy every step. I am on two other Board of Directors; Louisville Independent Business Alliance (LIBA) and Kentucky Natural Lands Trust (KNLT). 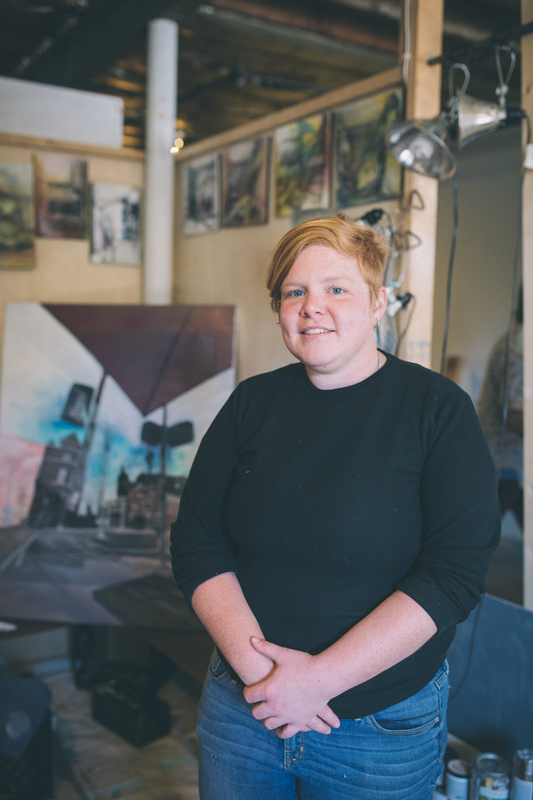 These three non-profits are the three things I am most passionate about –Local Art, Land Preservation, and keeping Louisville weird with locally owned small businesses. I am also very involved with the Forecastle Foundation who helps fund projects for KNLT, primarily in the Pine Mountain corridor. It is the most bio-diverse part of our state and the it is absolutely incredible. If you haven’t been, you must go! A picnic with my husband and my dog at Cherokee park. Ahhh! You know I can’t play favorites!! I am showing over 110 local artists at Revelry right now, and I love every one of them. I’ll say Julius Friedman, as he inspired me from a very young age to pursue a career in photography. I would like to see it like it is now, with a few minor changes. A better public transportation system and more of a focus on the environment and air quality would be a nice. Oh and I would love to see the Botanical Gardens come to fruition! A general move towards the city is happening right now, which I love. Now the city needs to be able to accommodate the move with grocery stores, more retail, and affordable housing. My husband and I just moved to Butchertown from the Highlands. We wanted to live where we worked both for the environment and the economy. I am enjoying watching this neighborhood (Nulu/Butchertown) become a walking neighborhood like the Highlands and Crescent Hill. Being able to walk to work, to get coffee, to dinner is what I am used to and it makes it all the better that I have green space like the Big Four Bridge in my backyard.